It is difficult to see how any surgery could use this sort of general criticism to achieve anything positive. More often I find that this sort of comment leaves staff demoralised and defensive. The premise of NHS Choices sounds superficially sensible. Provide potential patients with honest, good quality testimonials about GP practices. These rational and informed consumers will then choose to take their business to the best practices. The good surgeries are rewarded with new business. The underperformers will respond to patient feedback and improve, or eventually lose patients and go broke. In most industries and under normal circumstances this would make sense. But, General Practice is not a normal industry and these are strange times. In an environment of clinical staff shortages, many practices simply do not need or want to attract more patients. They simply cannot find or afford the staff they would need to look after them. In addition, due to practices boundary rules, patient choice may be limited to only a collection of equally poorly rated practices facing shared recruitment and demographic problems. Feedback is powerful. Thoughtful feedback given with good intentions by a skilled tutor or friend can encourage a student to improve and excel. But, careless feedback can hurt, demoralise and block progress. Author DrAWFosterPosted on October 15, 2016 December 1, 2018 Categories All posts, Blog, General Practice, Innovation, Leadership, Management, Practice improvement, Technology4 Comments on The trouble with NHS Choices… And a better way to do feedback? 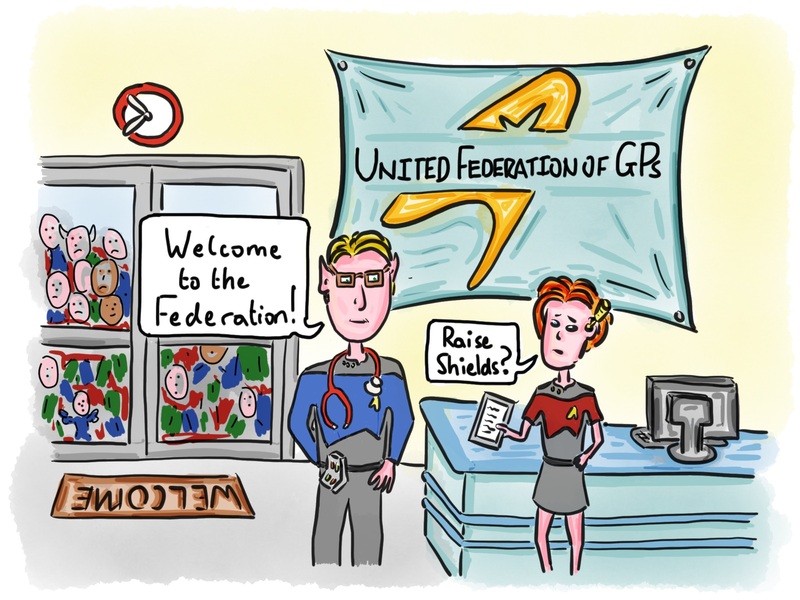 GP Federations – Live long and prosper? Are GP Federations the answer for General Practice? This week’s sketch is inspired by the return of TNG to Netflix. If you enjoyed my sketches or posts then please share on Twitter or Facebook and leave a comment! Author DrAWFosterPosted on July 30, 2016 December 1, 2018 Categories All posts, Blog, General Practice, Innovation, Leadership, ManagementLeave a comment on GP Federations – Live long and prosper? 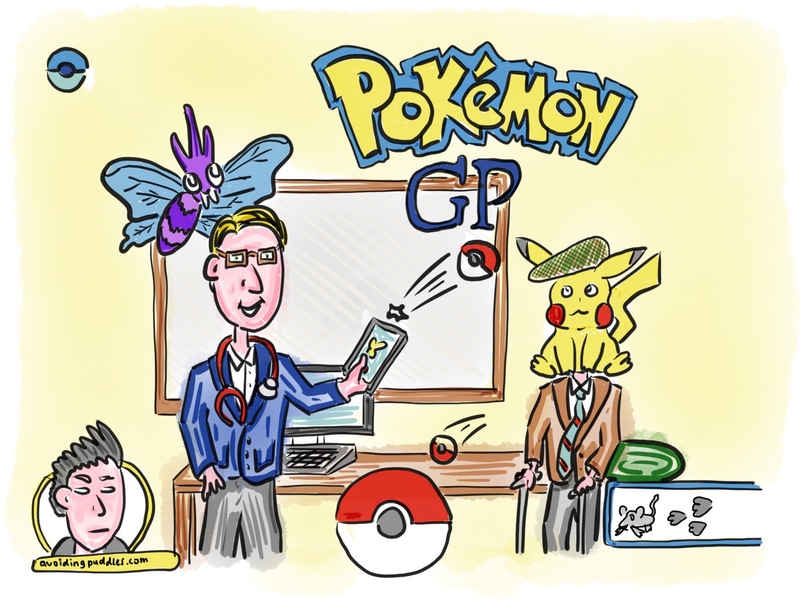 Author DrAWFosterPosted on July 23, 2016 December 1, 2018 Categories All posts, Blog, Innovation, Technology3 Comments on Seven reasons a GP is excited about Pokemon Go? 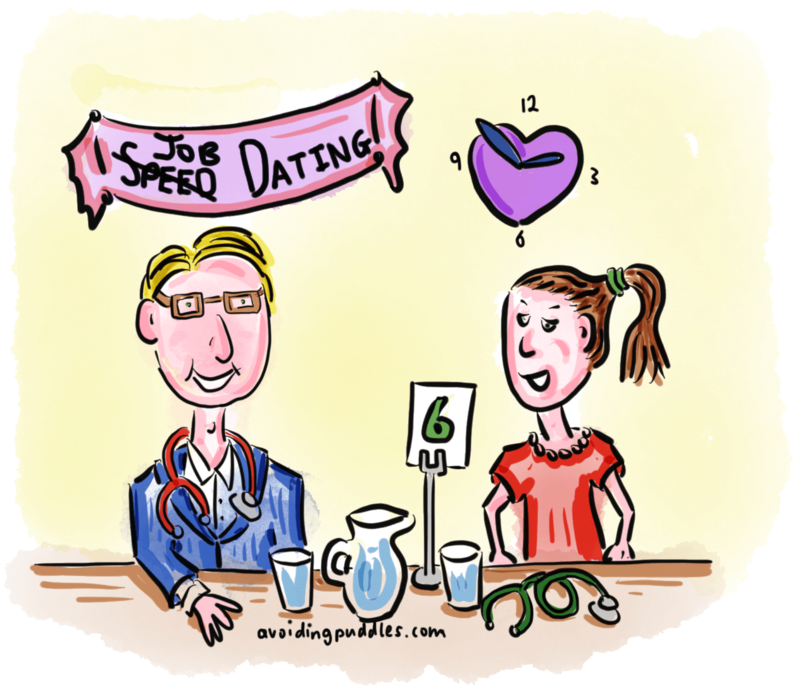 Author DrAWFosterPosted on July 3, 2016 December 1, 2018 Categories All posts, Blog, General Practice, Innovation, Leadership, Management10 Comments on The worlds of speed dating and GP recruitment, together at last! No, this is not Dr Puddle’s usual trip to the local Tesco Metro to pick up a ready meal after evening clinic. I’m playing a game. My old student penchant for computer role playing games, RPGs, has not entirely left me. I should probably be doing something more productive, like preparing for my appraisal next month. But then again, isn’t it important to unwind from time to time? It would be nice to think that all those hours exploring dungeons and slaying orcs were not wasted. And, perhaps they weren’t. Continuing Professional Development, CPD, is an essential part of life as a modern professional. Here in the UK, demonstrating ongoing development is a compulsory part of all doctor’s revalidation process. Over 50 hours of development activity must be demonstrated every year in order for us to be allowed to continue to practice medicine. As I reflect on how I plan to improve myself as a professional, it strikes me that RPGs have some powerful lessons to teach us about personal and professional development. That RPGs incorporate elements relevant to CPD is not surprising. A big appeal of the RPG genre is the experience of improving your character’s skills and abilities as you engage with increasingly difficult but rewarding stories and quests within the game world. All RPGs incorporate a system to model the accumulation of experience, skills and abilities. For example, the Fallout series quantifies a player’s abilities using the S.P.E.C.I.A.L. system. Player “stats” are rated 1 to 10 in the attributes of Strength, Perception, Endurance, Charisma, Intelligence, Agility and Luck. Your character starts the game weak and ordinary, but experience points earned through playing the game are spent improving your basic stats, and training in special abilities. Currency can be earned and exchanged for equipment and clothing, which further enhance “stats” and abilities. So what can RPGs teach us about improving ourselves in the real world?